Come and enjoy SOYA’s 200hr immersion at Tin Poppy Retreat near Salmon Arm, BC. This remote, 160 acre hidden gem is perfect for retreating into yoga studies while overlooking the Shuswap River. The SOYA curriculum is designed to help you excel at your yoga teacher career and your yoga lifestyle. Need more information on SOYA’s curriculum? Click on the button below for an overview and what the average day looks like! April 3 – 18, 2019 starting at 8am April 3rd. Lead Trainer: Natasha Scott starlityoga@gmail.com Additional SOYA grads will be guest teachers to lead the group in various asana styles. Location: Tin Poppy Retreat, Salmon Arm BC. Enjoy the small group experience where all your questions can be answered in a safe environment. This is a very special location for the training where students have the opportunity to live and eat together in a unique solar powered retreat between Salmon Arm and Enderby. Enjoy cozy spaces, evening saunas, and stunning views. Program Fees: Save $300 and register by February 1st and pay $3060 including GST! After Feb 1st pay $3360 including GST. A non-refundable deposit of $650.00 + $32.50 GST = $682.50 is required upon registration. Payment plans are available on request. Fees include your manual, books, supplies, gst and the Martin Kirk Anatomy online training ($300US value). Accommodation Fees 16 nights (arrive April 2): Shared room = $820 including gst. Single room = $1095 including gst. (accommodations are included for the night of April 2nd). Offsite facility fee = $325 including gst. NOTE: this house has an open concept layout. The single room is a private sleeping space in a windowed veranda. The shared room is 2 bunks in a bedroom. Meals: Bring your own food to be prepared in a large country style kitchen. In service to each other, students will prepare dinners together. Learn more about the curriculum and the program. To register, please click the link below. Natasha Scott graduated from the SOYA 500 Hour training in 2009 with a specialty in prenatal yoga. She teaches a wide range of Hatha Yoga with a strong background in the Sivananda lineage (from her Teacher Mugs). 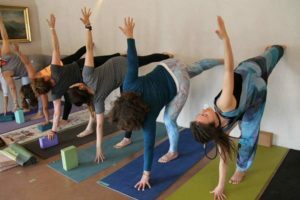 From her super gentle yoga classes to strength in flow yoga, Natasha has a class to suit everyone. She is a Yoga Alliance registered E-RYT500, prenatal yoga teacher (RYPT) and Childrens Yoga Teacher (RYCT). She is a Certified Thai Massage Practitioner (Metta in Motion with Mia Blackwell), and a Reiki practitioner. She brings all of these yoga tools to her classes to create a full yogic experience. 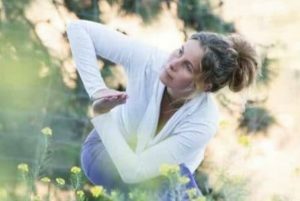 Never one to stop learning her enthusiasm to serve others led her to specialize in Yoga for Chronic Pain, certified by Neil Pearson. Natasha is a Lead Trainer for the SOYA 200 hour YTT Immersions in Salmon Arm, BC and Melaque, Mexico, and the SOYA 300 hour Advanced Upgrade in Penticton.